Bring color into your home office! For almost everyone the home office has become almost like our living rooms. It’s the room that we take care of family business, the kids do their homework there, and of course we connect with friends online. Your home office should be a productive space, but even better it should inspire you to want to spend more time in it. Summer is almost here and what better time to bring summer color, decor, and organization tools into your home office? Here are a few ways to create a home office that is enjoyable to be in daily. One of the greatest parts of summer is the ability to let go of the cold winter colors and bring in bright and cheery colors. First, start off with opening up your home office and replacing dark and heavyweight materials and window treatments with lighter weight cottons, organza and linen fabrics. These fabrics allow more light into your space and will instantly create a home office that is inspiring from an aesthetic vantage point. Colorful furniture, desk accessories, textiles and even office supplies can instantly change your mood too! Visit your local home office supply store and look at the designer colors available for your home office. From filing folders to periodical organizers, you will love colors like turquoise, orange, chocolate brown, and hot pink to help bring summer into your dull busy work in the office. Where did you go on your last vacation? When is the last time you went outside and sat in the grass under a tree during summertime? These are questions to help you get inspired for adding decoration to your home office. While we want to be productive, we also enjoy inspiration around us when working. 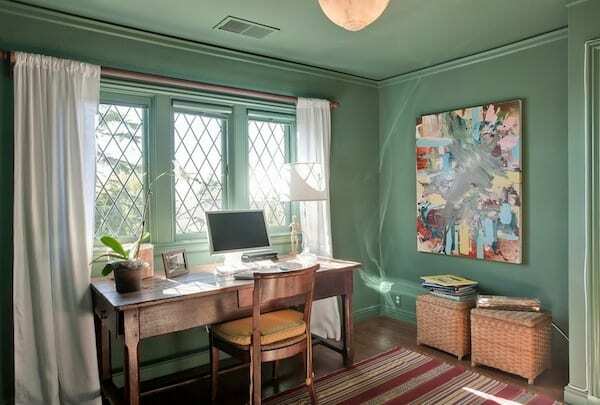 Paint your office the color of the water from your last beach cruise vacation or hang a painting that reminds you of the cool summer breeze outside. Everyone gets sparked and rejuvenated in different ways. Surf the internet, look through some travel magazines, or find your favorite designer and look at colorful summer inspirational ideas to infuse into your home office. You would be surprised at how a few elements such as window treatments; a new accent wall in tangerine and a playful accent rug will turn your office into a new destination at your home. This summer infuse all of the playfulness of summertime play with the kids, a calm beach from your last vacation, and the juiciness of a fresh snow cone into your summer home office. With color, light, textiles and new organizational items – you will love how summertime could last all year round in your home office!